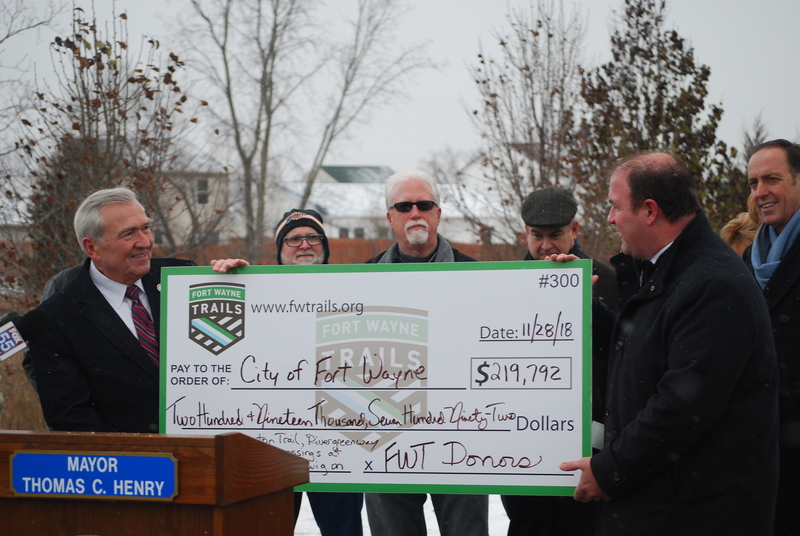 Fort Wayne, November 28, 2018 – Fort Wayne Trails presented Mayor Tom Henry with a check for $219,792 towards trail development Wednesday morning at the City’s Ribbon Cutting for the new section of the Pufferbelly Trail from Wallen Road to Washington Center Road. $150,000 of this contribution will go towards funding the right-of-way acquisition of a new section of the Covington Road Trail from Hadley Road to Getz Road beginning in 2019. This trail will help to connect the southwest Fort Wayne trails known as the Aboite Trails to Time Corners Shopping Center. These funds were contributed mainly from residents of the Southwest Allen County area. Design will be begin in 2019 and construction will begin on this section in 2021. $50,000 of the contribution will go toward the newly installed flashing pedestrian crossing lights along the new Pufferbelly Trail section at Wallen, Cook and Ludwig Roads. These funds were donated to Fort Wayne Trails by citizens and businesses in our community through the 100 Mile/100K Campaign in early 2018. $19,792 funded the final grading, landscaping and reseeding of grass along the St. Joseph Pathway near the Plex, and PFW soccer fields which was completed in summer 2018. This trail was completed in late 2017, and was the 100th mile of trail built in our community. These funds were donated to Fort Wayne Trails from a variety of sources. 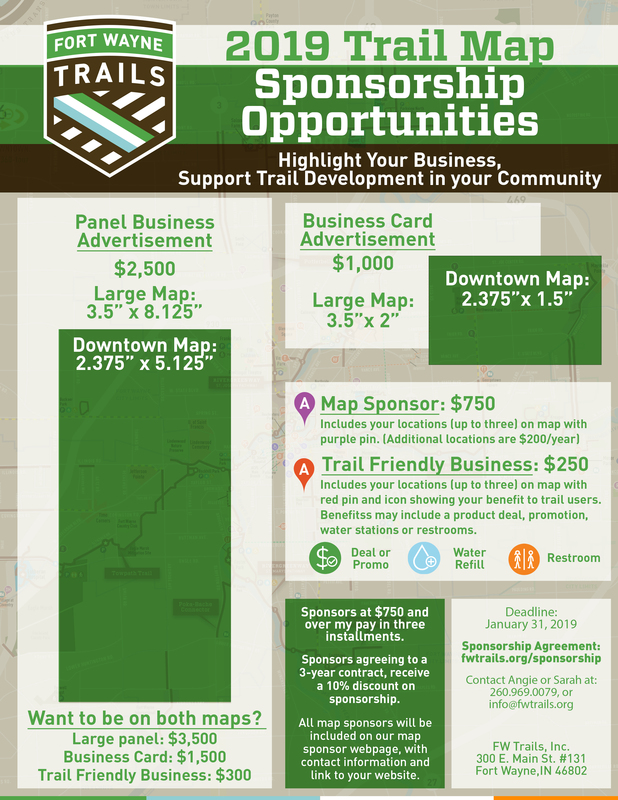 “Our organization is fulfilling our mission by raising private dollars to leverage local municipal funding for trail development. This contribution is just part of who we are at Fort Wayne Trails, and it plays an important role with citizens continuing to engage in the development of trails like they have been since the mid nineteen seventies,” stated Kent Castleman, Executive Director.